The new ITR forms have shifted the entire onus on taxpayers to prove their claim for deductions, expenses or exemptions. The new Income Tax Return (ITR) forms released for the assessment year 2018-2019 seek more details from taxpayers than they did in previous years. Overall, there are over 25 key changes compared to last year across all the forms meant for individuals, businesses and other assessees. Most of these changes require taxpayers to give the break-up of information provided or other details that help the income tax department to reconcile the transactions that taxpayers report. "It is apparent that the new ITR forms have shifted the entire onus on the taxpayers to prove their claim for deductions, expenses or exemptions," says Naveen Wadhwa, general manager, Taxmann.com. Those with income from salary, one house property and other sources (like interest) use the most basic one-page ITR-1 or Sahaj form. In the last assessment year, around 30 million taxpayers used this form. The form now seeks additional details of salary. The taxpayer first needs to fill up salary amount excluding allowances, perquisites, and so on. Then, provide details pertaining to perquisites, allowances, 'profit in lieu of salary', etc. Up to last year, an assessee was required to mention only the taxable figure of salary. The same goes for income from house property. The form now wants the taxpayer to provide the break-up of gross rent received, tax paid to local authorities, etc. Wadhwa points out that taxpayers now need to give specific details in case of capital gains too. The new ITR forms have specific columns to report each capital gain exemption separately. Details of each capital gains exemption under Sections 54, 54B, 54EC, 54EE, 54F, 54GB and 115F need to be reported in its applicable column now. A taxpayer availing these capital gains exemptions needs to mention the date of transfer of original capital asset which was missing in earlier ITR forms. The Budget had also introduced penalties on late filing of tax returns. If the return is furnished after the due date (July 31) but before December 31, the penalty is Rs 5,000 and Rs 10,000 after that. Tax experts believe that the income-tax software will not allow assessees to start filing their returns unless they pay the penalty first. Relevant changes have been included in the new ITR forms wherein a new row is added to enable the taxpayer to fill the details of late filing fees. Unlike last year, non-residents cannot use the ITR-I. "The ITR-1 form is not applicable to non-residents and not ordinarily residents, who would now have to file their tax returns in the ITR-2 form. Non-residents can seek a refund in a foreign bank account by providing details of one foreign bank account," says Amarpal Chadha, tax partner and India mobility leader, EY India. Earlier, the forms didn't distinguish taxpayers based on their residency. Tax experts say the assessment of returns is done through computers. The authorities are, therefore, seeking additional data across different forms to reconcile different transactions to ensure better compliance. The presumptive taxation scheme -- meant for small businesses such as freelancers and shop owners and for professionals such as doctors -- does not require the taxpayer to maintain books of accounts or get their financials audited. The assessees can pay a percentage of their total turnover as the tax. The old ITR-4 sought only four details -- total creditor and debtors, total stock-in-trade, and cash balance. But the new form asks for more financial details of the business such as the amount of secured and unsecured loans, advances, fixed assets, capital account and so on. Tax experts say the details sought essentially requires the person to maintain balance sheet to report the information asked. These details are essentially sought after the implementation of the Goods and Services Tax. The business owner also needs to provide GST number of the assessee and the amount of turnover based on the GST return filed. Earlier, business owners reported a different turnover for income tax and other indirect taxes based on their convenience. 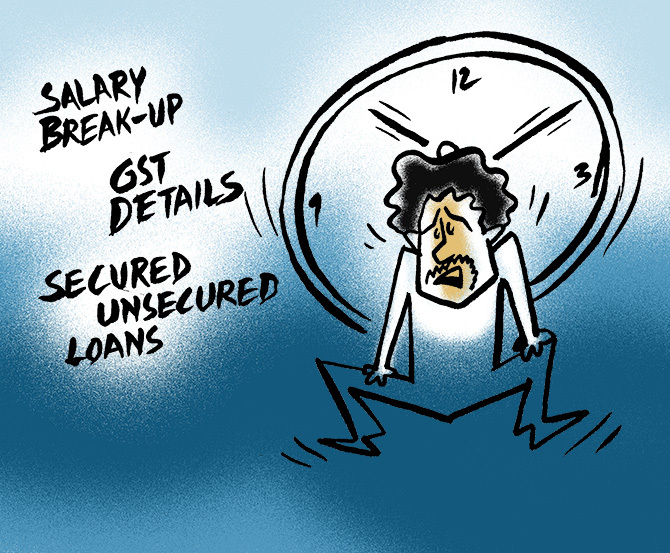 The details disclosed in the ITR can now be crossed-checked with the GST filing. Chadha also points out that the newly notified ITR-2 form is no longer applicable for individuals who have profits and gains from any business or profession. The assessee now needs to use ITR-3 to file the return. Until last year, a partner was allowed to file the return using ITR-2. The government had made changes to the taxation of employee stock option plan in an unlisted firm in the previous year's Budget. The amendments are applicable from this assessment year. The new provisions state that if unlisted shares are transferred at a price which is lower than its fair market value (FMV), it would still be taxed at the FMV that a merchant banker or a chartered accountant calculates. While filing the return, employees will need to obtain valuation report in case of sale of unlisted shares to ensure that they correctly report the capital gains or loss. The ITR form also asks for the detailed break-up of such transaction. The ITR-6 meant for businesses now seeks many details about GST transactions. A company needs to disclose transactions in exempt goods or services, transactions with composite suppliers, transactions with registered entities and total sum paid to them and even those with unregistered entities. Business owners need to ensure that their GST returns filed matches with the details provided with those provided in the income tax form.